Same Great Pond Clear, but designed for the budget-minded pond owner - allowing you to purchase a month to month supply. Pond-Clear utilizes specially formulated starins of bacteria to help create a healthy pond ecosystem, reducing mucky bottoms and providing sparkling clear water. If you're not adding specialized bacteria or running an aeration system, the bacteria currently working in your podn are mainly anaerobic, meaning they do not require oxygen to survive. Anaerobic bacteria will decompose organics at an extremely slow rate while producing by-products such as a "rotton egg" smell and black muck. Anaerobic bacteria are also relatively ineffective at oxidizing nutrients suspended in the water column. Aerobic bateria, found in Pond-Clear, use oxygen and are apapble of decomposing organics at an accelerated rate. 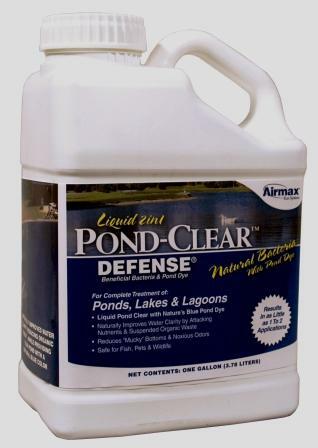 Formulated with speciaized strains of bacteria, Pond-Clear produces no foul smelling by-products and does not contribute to black muck. This product also contains Natural Blue Colorant that will beauty your pond with a natural blue color. 1 Gallon Container will treat up to ¼ acre for 2 months or ½ acre for 1 month. Blue dye is food-grade and will not stain your skin or animal's fur. Apply directly out of the container. Pond Clear Liquid works best when poured in several spots along the shoreline. Apply every two weeks when water temperatures are above 50° F. Wait 3 days after an algaecide and/or herbicide treatment to apply. use 1 gallons per surface acre every 2-4 weeks.